According to a new study, if you devote your lunch hour to a nap, you may perform and learn better in the afternoon. Napping at midday, when the brain's ability to learn may have deteriorated, may clear the brain's memory "storage area" and make room for new information. In the study, the nap group was given the chance for a 90-minute siesta at 2 p.m.; the no-nap group was asked to stay awake. People in the group which didn't nap had a 10% reduction in their learning capacity. The people who had a nap improved their ability to learn by 10% (not much). Can a Mid-Day Nap Make You Smarter? WebMD. 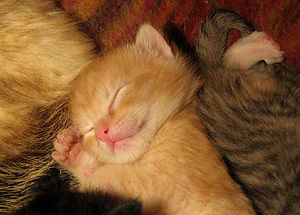 Image source: Sleeping kitten. Wikipedia, Tilman Piesk, public domain. I think so. I may believe on that thoughts and ideas of yours. what about a more feasible 20 min one?